I have dream of becoming rich. Do you follow same dream? If yes you must explore what it takes to be rich and what are the beliefs and secrets of rich people.We are herewith 20 Secrets of Rich people. 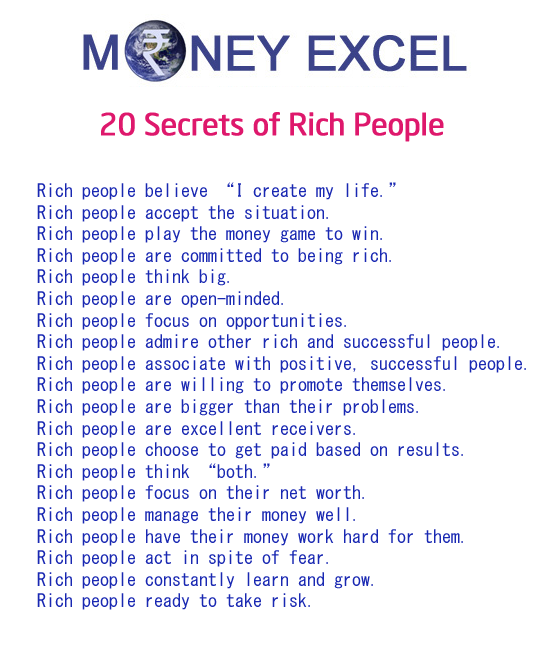 20 Secrets of Rich people. If you want to be rich, it is imperative that you believe that you are at the steering wheel of your life, especially your financial life. If you don’t believe this, then you must inherently believe that you have little or no control over your life, and therefore you have little or no control over your financial success. That is not a rich attitude. 2. Rich accept the situation & they don’t play blame game. Rich people posse’s quality that they accept situation and they don’t play blame game. Poor and middle class play blame game for any and every situation they blame people, government, economy, policy, stock market and even god. They do that because they don’t have ability to change situation. 3. Rich play the money game to win. Poor people play the money game to not lose. Poor people play the money game on defense rather than offense. Let me ask you: If you were to play any sport or any game strictly on defense, what are the chances of your winning that game? Most people would agree, slim and none. Yet that’s exactly how most people play the money game. Their primary concern is survival and security instead of creating wealth and abundance. 4. Rich are committed to being rich. Poor people want to be rich. Rich people are committed and clear that what they want in life. They are unwavering in their desire. They are fully committed to creating wealth. As long as it’s legal, moral, and ethical, they will do whatever it takes to become rich. Remember -If you are not fully, totally, and truly committed to creating wealth, chances are you won’t. 5. Rich think big. Poor people think small. Rich people think big and play big game. 6. Rich are open-minded. Poor people are narrow-minded. Rich people are open to new idea and learning. They are open-minded while poor people are conservative in nature. 7. Rich people focus on opportunities. Poor people focus on obstacles. Rich people see opportunities. Poor people see obstacles. Rich people see potential growth. Poor people see potential loss. Rich people focus on the rewards. Poor focus on the risks. 8. Rich admire other rich and successful people. Poor people resent rich and successful people. 9. Rich associate with positive, successful people. Poor people associate with negative or unsuccessful people. Riche people network with positive and successful people. They see successful people as a means to motivate themselves. They see other successful people as models to learn from. 10. Rich people are willing to promote themselves and their value. Poor people think negatively about selling and promotion. Rich people are almost always excellent promoters. They can and are willing to promote their products, their services, and their ideas with passion and enthusiasm. 11. Rich are bigger than their problems. Poor people are smaller than their problems. For Rich people every problem is small problem. Rich people are big problem solvers. The bigger the problems you can handle, the bigger the business you can handle; the bigger the responsibility you can handle, the more employees you can handle; the more customers you can handle, the more money you can handle, and ultimately, the more wealth you can handle. 12. Rich are excellent receivers. Poor people are poor receivers. 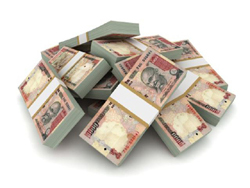 To earn large sums of money for your work & products, you must feel worthy of receiving large sums of money. Here’s a great practice for improving your receiving skills: when someone offers you compliment, simply say accept and thanks. Don’t look for something to compliment the other person with. 13. Rich choose to get paid based on results. Poor people choose to get paid based on time. Rich people prefer to get paid based on the results they produce, if not totally, then at least partially. Rich people usually own their own business in some form. They make their income from their profits. Rich people work on commission or percentages of revenue. Rich people choose stock options and profit sharing in lieu of higher salaries. Rich people live in a world of abundance. Poor people live in a world of limitations. Of course, both live in the same physical world, but the difference is in their perspective. Do you want a successful career or a close relationship with your family? Both! Do you want to focus on business or have fun and play? Both! Do you want money or meaning in your life? Both! Do you want to earn a fortune or do the work you love? Both! Poor people always choose one, rich people choose both. 15. Rich focus on their net worth. Poor people focus on their working income. Remember the true measure of wealth is net worth, not working income. Rich people understand the huge distinction between working income and net worth. 16. Rich manage their money well. Poor people mismanage their money well. Rich people are good money manager. Rich people carries supporting money habits. Rich people handles money well. 17. Rich people have their money work hard for them. Poor people work hard for their money. Rich people know how to generate more money from money. Rich Invest money to grow it, rich do smart work and poor do hard work. 18. Rich people act in spite of fear. Poor people let fear stop them. Fear, doubt, and worry are among the greatest obstacles, not only to success, but to happiness as well. Therefore, one of the biggest differences between rich people and poor people is that rich people are willing to act in spite of fear. Poor people let fear stop them. 19. Rich constantly learn and grow. Poor people think they already know. Rich people believe in constant learning and growing. Rich people know that knowledge means power. 20. Rich people ready to take risk. Poor people avoid taking risk. Rich people are risk takers. They take calculative risk to make money. Poor people avoid or delay taking risk. Remember becoming rich is within your reach. If other can do that you can also do that. Why middle class people always remain under pressure? « Gold price is falling – Good time to buy?